Whether it’s attending an art walk, visiting a national memorial, or enjoying the beach, Bradenton has plenty of free and cheap things to do. Here are 10 family fun adventures you can enjoy around Bradenton, while on a budget. On the first Friday and Saturday of the month, the Village of the Arts hosts a vibrant art walk. The art walk features unique galleries, studios, healing arts, specialty shops, food, and live music. The art walk hours are from 6 p.m. to 9:30 p.m. on Friday and 11 a.m. to 4 p.m. on Saturday. The Village of the Arts is located at 1113 12th St. West, Bradenton, FL 34205. For more information, call 941-747-8056. Listed as a National Register of Historic Places, the Cortez Historic Fishing Village has kept its Florida Gulf Coast Heritage. The village offers a free museums and allows you to walk through old fish houses. You can also listen to locals tell their fishing tales. The village is located at Cortez Road and Intracoastal Bridge, Cortez, FL 34215. Museum hours are Tuesday through Saturday, from 9 a.m. to 4 p.m. For more information, call 941-708-6120. Riverwalk Public Art, an outdoor gallery made up of 19 pieces of art, is created by artists competitively selected through the Downtown Development Authority’s Public Art Program. The collection offers interactive sound sculptures, river history and beauty. Check out the sound dishes, splash pad, sculptures, drum yard and more. Riverwalk is located at 452 3rd Ave. East, Bradenton, FL 34208. De Soto National Memorial is free to the public and open from dawn to dusk. The park features a nature trail which allows you to explore various Florida ecosystems. Throughout the trail there are signage and waysides that tell the story of the De Soto Expedition and the natural history of the area. The park also offers a picnic area, bird watching, fishing areas and small beaches. The memorial is located at 8300 De Soto Memorial Highway, Bradenton, FL 34209. For more information, call 941-792-0458. At Manatee Village Historical Park, experience the history and way of life in Manatee County before modern conveniences. The park offers a collection of restored buildings. Visit the park Monday through Friday and on the second and fourth Saturday of the month, from 9 a.m. to 4 p.m. The village is located at 1404 Manatee Ave. East, Bradenton, FL 34208. For more information, call 941-749-7165. On a mission to preserve and share Florida’s maritime heritage, the Florida Maritime Museum offers many collections. Enjoy the beautiful and expansive “Black Banks” shell collection, ship models, a maritime library and more. Every now and then the museum also features exhibits. Admission to the museum is free. You can visit Tuesday through Saturday, from 9 a.m. to 4 p.m. The museum is located at 4415 119th Street West, Cortez, FL 34215. For more information, call 941-708-6120. 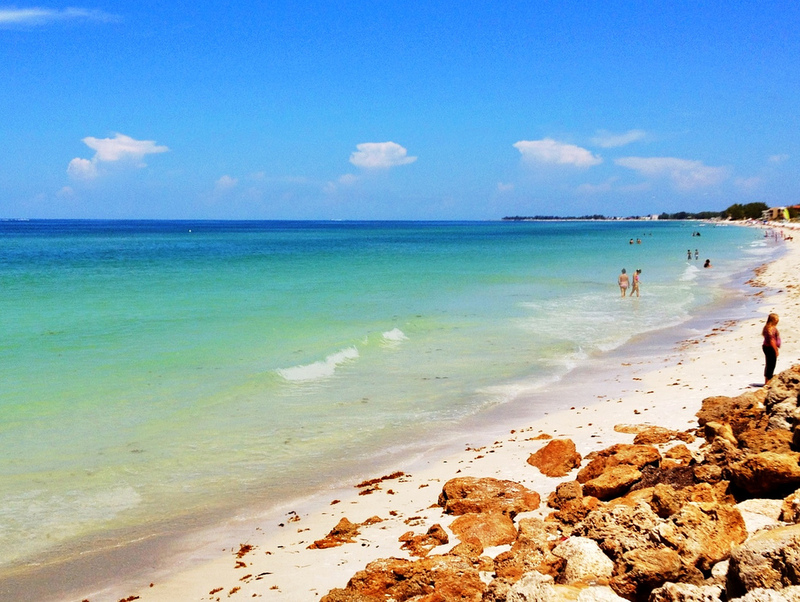 If you’re looking for tranquility, Anna Maria Beach offers it. Visit the beautiful sandy beach with the family for free. The beach is located at 115 3rd St. South, Bradenton Beach, FL 34217. Free parking is available in a lot at the corner of Spring Avenue and Gulf Drive. With free parking, concessions, lifeguards, restrooms, picnic tables and showers, Manatee Beach is also a great beach to visit with the family. The beach is located at the end of Manatee Avenue. Located on Florida’s Anna Maria Island, Island Gallery West was established 25 years ago by a group of local artists. The gallery hosts free art demonstrations beginning the first Saturday of January through mid-March, from 10:30 a.m. to noon. Seating is first come, first served. The gallery is located at 5368 Gulf Drive, Holmes Beach, FL 34217. For more information, call 941-778-6648. Learn the history of Anna Maria Island, at the Anna Maria Island Historical Society Museum, for free. The museum displays artists, photographs and maps. Visit the museum, January through April, from 10 a.m. to 4 p.m., and May through December, from 10 a.m. to 1 p.m. The museum is closed on Sundays and Mondays and is located at 402 Pine Ave., Bradenton Beach, FL 34216. For more information, call 941-778-0492.